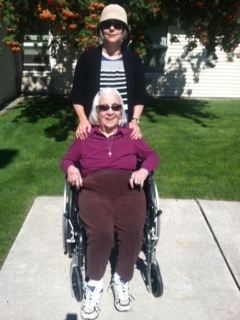 My beloved Gramma Jewell Cochran Hotz returned to the stars in the wee hours of the morning on Sunday, September 6th. She liked the wee hours — I have many memories of her waking up before dawn to write in her journal, take her first of many walks of the day, and get things under way before others woke up. At the time of her death, Jewell (or “Tita,” as my Grandpa Preston called her) was 93 years of age. Of all the relationships with humans I’ve had in this life, there’s never been one that was cleaner, so completely without resentments or unsaid grievances and disappointments. So simpatico and reciprocal. I am fortunate that I had the opportunity to spend time with her just this past May. My Jewell was floating far away but she occasionally hovered in close to ask me pointed and precise questions: How was my daughter Isobel? How was her father Jean-David? I was a professor at Marylhurst University, correct? My brother is Jeremy, is that right? I am Susie’s daughter? I live in Portland? I am not ready to write anything new about my Gramma beyond this bit that I’ve written. As many of you have read previous essays in which I’ve written about my Gramma and our relationship, I wanted to share with you that she is no longer on the planet in her embodied form. For now, I thought I’d republish some of the previous Gramma Jewell essays, in loving tribute. If there is a particular human being who inspired me to become a gero-punk, it is my Gramma Jewell. Several years ago my grandfather died of Alzheimer’s disease and soon after his death my Gramma started having a series of small strokes and she became wobbly on her feet. Whereas she used to divide her awake time as an old woman between taking long walks, writing letters, helping with chores, and reading, now she spends most of her time sitting in her recliner reading large print books and observing the activities unfolding around her. Her lucidity is ever-shifting so it is of benefit to sit quietly beside her for long stretches of time so you don’t miss one of her insightful questions or statements. A particularly gripping recollection I have of me and my Gramma is from July of 2008. My Gramma was in bed getting ready for sleep and I was called into her room to wish her a goodnight. I snuggled-down in bed with my Gramma, she on her back, I on my right side with my arms and legs embracing her and my body curled around her. She asked me questions to remind herself of who I was, who my daughter Isobel was, who she herself was. She asked me questions about my work and about my life in Portland. I could tell Gramma was attempting to orient herself in time, place, and space. Eventually, as she moved closer to sleep, she cast her mind into the remote past, when she was a girl picking apples on an orchard; when she was a young married woman and mother, raising small children and helping my grandpa with his work. Gramma was luminous there beside me in her flannel pajamas, her teeth and face freshly washed, her hair cut exactly like mine but completely silver. The smell and feel of her skin – like a soft, almost over-ripe peach – started to unwind tight tangled balls of my own memories. I had temporal distortion—Isobel had changed so much in the past year; I certainly felt time working on me; but my Gramma seemed suspended in time. And yet not. Another deeply embodied memory of my Gramma gets stirred almost daily when I wash the dishes. As far back into my own history as I can cast my mind, my Gramma Jewell had the practice of washing dishes in a white plastic basin, and she continued this practice until my aunt moved her and my Grandpa out of their home to live with her, followed by moving my Gramma into an assisted living facility in 2010. After that, my Gramma didn’t need to do dishes any more and, until then, my grandparents lived in the same home for decades, in Menlo Park, California, a home without a dishwasher or other modern amenities. For my entire life, or at least as long as I can remember, they maintained the same furniture and style of dress, they rented art from the library, and their diet was sparse and uninteresting. There were other seemingly related practices of modesty, too – they walked or took public transportation rather than drive their old car. And during one of the California drought summers, my Gramma, so as to conserve scarce water supplies, pulled up by hand all of the lawn in the front yard until all that was left was a hard earthen surface (though now I suspect it was as much about water conservation as about preventing my grandpa, who was quite a bit older than my Gramma, from having to mow the lawn). Despite all of these indicators of a kind of carefulness and frugality, never have you met more generous folks! Nor more well-traveled. In addition to helping the rest of us live as well as we could, they used their savings to visit the Wall of China, New Zealand, the British Isles…when I was little I fantasized they’d take me with them on a trip someday. I never had the opportunity to go on a grand global adventure with my grandparents, though I do have intense memories of walking all over Menlo Park, Palo Alto, and “The City” (San Francisco), mostly with my Gramma. I also remember my “R-and-R” trips to visit them during my late teens and early 20’s while on break from my undergraduate and graduate studies. I always looked forward to talking with my Gramma about all the books I was reading and big ideas I was thinking about. We weren’t just Gramma and Granddaughter, we were comrades.